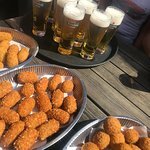 Tours from Bike & Bite Rotterdam Food Tours tend to sell out - travelers recommend booking in advance! Thanks so much for this lovely review, we're glad Rodger was able to show a group of American women from Amsterdam how great Rotterdam is! Rodger thoroughly enjoyed showing you around as well, and was happy to hear that you enjoyed the tour. Rotterdam visited with a group of 40 people. Before we came over we decided to contact Laura our lovely tour guide. We were split up in two groups and we started cycling into the city centre. 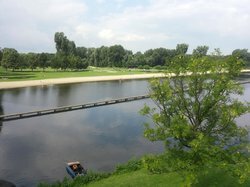 We were amazed by this beautiful city, clean and spacy.The weather was nice, sunny and warm so it was very pleasant to stop for a bite and drink on the way. Laura,our guide,told us all kinds of things about the city and gave us tips what to see or do afterwards. I will most definetly recommend this tour to the one's who want to see the highlights of Rotterdam. You don't have to bike far between stops so it's quite easy! Big thanks to Laura and Ruben. 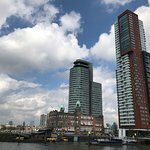 We just came back from a company trip to Rotterdam and one of the highlights of the trip was the biking tour around the city. Roger and Daniel were on our team and were just great. I heard nothing but the same from the other group. Thanks a lot!! Skál!! Thank you very much! Rodger and Daniel enjoyed showing you around as well, you're a great group of people, tnx again! Enjoyed every minute of the cycle tour last weekend. Our guides Dice (probably spelt incorrectly) and Sabine were excellent: friendly, knowledgeable and great company. 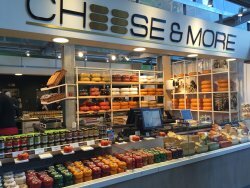 The tour was really well curated, a perfect blend of sightseeing and well timed stops for delicious snacks and drinks at a cafe, a hip foodie warehouse and a cheese stand at the Markthal market. A great way to experience this very cool city up close. Highly recommended and hope to repeat some day! Love this review, thanks! And you almost got his name right: Thijs. Although I think Dice is a pretty cool name as well :). Glad you enjoyed the tour and the city and hope welcome you back some day in the future! We had an amazing tour with Paul, the owner of the tour company. The sites and the bites were great and we got to see and hear about so much of this beautiful city. Highly recommend this tour. The riding is easy going even for our unfit family. This is so much better than sitting on a bus and listening to an audio guide! Really enjoyed showing you and your family and friends around, I was glad I could show a 'native' some new things about the city :). Hope you enjoy the rest of your stay! Just returned from a day trip to Rotterdam with my two sons and one of their pals. Our first visit to the city and I am pleased we booked the Bike and Bike tour. The ferry transfer dropped us in the city centre just by the tour meeting point and after a coffee and purchase of jackets (we mis gauged the weather) we met our guide and collected our bikes. Laura, our guide, is great. She is lovely and happy to join in with our group chat and jokes and it was a pleasure to learn so much about a new city. It would have been difficult to get my teenager gang enthusiastic about sites, architecture, statues and ceilings without Lauras' enthusiasm and perfect timing and delivery. We had a fantastic memorable day. I would not hesitate to recommend the tour. I can imagine it works for almost any dynamic of group but it was perfect for my team of teenage boys (and me) with a bit of everything along the way, including a very welcome and refreshing beer or two!